The fourth Ysselmeercontest was held on saturday 12 may. This contest was again blessed with wunderfull weather. Besides many contacts on 10 and 24 GHz this contest also brought the first ever contact in PA0 on 76 GHz with a QSO between PAoHRK and PA0EHG over a distance of 15 kilometer. A QSO with PA0JGF on 76 GHz failed with both stations therefore this band is not counting in the contest. On 10 Ghz several stations made a QSO withG3LQR and G3XDY which gave them lots of points and a very nice ODX. On 24 GHz QSO's where made with PA0BAT, PA0EZ and PA3AWJ. 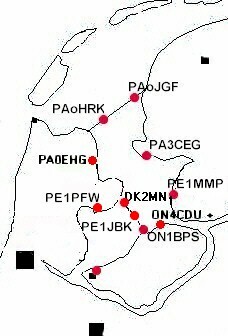 Almost all stations arround the Ysselmeer worked eachother on 24 GHz. On 47 GHz there where some new stations QRV but unfortunatly none of them succeeded in making a QSO. for further information and application forms. Exchange: Callsign, RST and locator, in the log also the time and distance most be added, logs should be sent to PA0EHG before 15 may. Prize's will be rewarded at the VHF-UHF-SHF meeting of 19 may in Meppel.